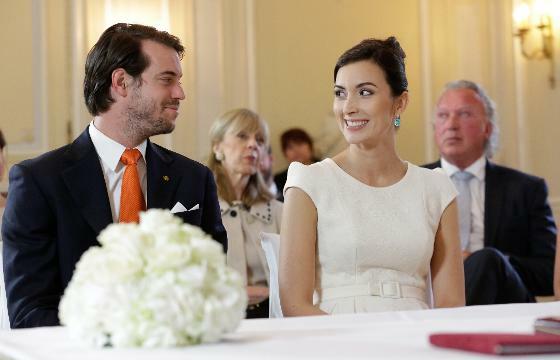 Earlier today Prince Félix and Claire Lademacher married in civil ceremony performed at Villa Rothschild in the German town of Königstein im Taunus. The ceremony was performed by Leonhard Helm, the town's mayor. The private ceremony was attended by only the immediate family of the bridal couple. The couple will also be united in religious ceremony that will be held Saturday in France. Princess Claire looked radiant in a white peplum dress with cap sleeves by Dutch designer Jan Taminiau accessorized with aquamarine earrings. Prince Félix paired his dark suit with a Nassau Orange tie. It was a subtle but fitting accessory for Nassau prince as he wed in a location historically tied to the Nassau dynasty. Princess Claire's bouquet was of white Platinum Avalanche roses and hortensia flowers. Gabriele Lademacher wore a light colored dress and matching jacket with dark embellishments by Moschino. The Grand Duchess shined (literally) in one of Edouard Vermeulen designs for Natan. Princess Alexandra wore a shiny maroon looking dress while the Hereditary Grand Duchess wore a coral or salmon colored dress with flared sleeves, both by Prada. Princess Tessy wore a knee length mint coloured dress by Lynn Adler. Princes Gabriel and Noah, the youngest members of the family, accompanied their parents while wearing similar Bavarian-style vests. You can find photos in all of the usual locations. Wort has about 20 articles in four languages related to the wedding. I recommend these these three for photos: one, two, three. Their article on the Luxembourg Palace is interesting and shows some of the connection between the wedding location and the Grand Ducal Family. The information about the clothing, flowers, venue and guests is press pool information and will be nearly identical no matter where you read it (already included above with a few additions). RTL has conveniently gathered most of their photos into one page. Be sure to also check out the photos from Getty and Tageblatt because they're a little different than the others. The Cour Grand-Ducale has some really great HQ photos available. Sydney was in Königstein for the wedding. Be sure to check back later for her report and updated information.